ACS is pleased to distribute “Applying the Rationale of Twombly to Provide Safeguards for the Accused in Federal Criminal Cases” by Robert L. Weinberg, Adjunct Professor at George Washington University Law School. The Supreme Court’s decisions in Bell Atlantic Corp. v. Twombly and Ashcroft v. Iqbal established a heightened pleading standard for federal civil cases, resulting in “an unexpected bonanza of pleading safeguards protecting defendants in future civil cases of all types,” Weinberg explains. This setback for civil plaintiffs, however, could be a gain for criminal defendants. 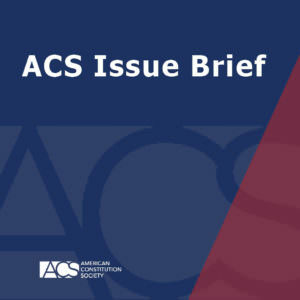 This Issue Brief explores the application of Twombly and Iqbal in the federal criminal context. With Twombly and Iqbal requiring that a complaint articulate “plausible,” “factual allegations,” as opposed to “conclusions of law,” Weinberg argues that a criminal defendant should be at least as entitled as a civil defendant to be advised by the charging document of the factual basis for the charge filed against him. The Issue Brief explains, “[t]he burden spared a defendant by a successful motion to dismiss the case under [the Federal Rules of Criminal Procedure], is even more important to that defendant’s welfare than is a dismissal under [the Federal Rules of Civil Procedure] to a civil defendant, because the criminal defendant’s liberty, rather than the civil litigant’s time or money, is at stake.” Weinberg concludes, it is time to “retire” the current criminal pleading standard just as Twombly “retired” the original civil pleading standard.